Well-traveled non-Mandarin or Cantonese speaking readers I have a test for you- name a famous Chinese pop singer. Could you do it? If you did– now name another. Lost yet? The point is much of Chinese popular culture is not publicized in Europe or the Americas. But here is a question I bet more of you can answer- who are Ling-Ling and Hsing Hsing? If you said Pandas- you are right, if you said Giant Pandas you get a bonus point! The Giant Panda is one of China’s most successful and historic cultural ambassadors. As early as the Tang Dynasty (618-907) there is record of a Chinese emperor sending pandas as gifts to Japan. The practice became famous when US President Richard Nixon visited China in 1972 and was gifted Ling-Ling and Hsing-Hsing. The pair instantly became one of the most popular exhibits at the National Zoo in Washington DC. Several generations of school children- this writer included- have grown up giving elementary school reports about these beautiful animals. If you still have childhood fondness for these cuddly giants you shouldn’t make a trip to China without a trip to the Chengdu Research Base of Giant Panda Breeding (the base) in Sichuan province. Despite its popularity the Giant Panda remains on the endangered species list where it has been decades. However there are major efforts underway to preserve panda habitats and help them breed. The panda’s natural home is the central mountain ranges of China including the Sichuan, the Shaanxi and Gansu provinces. There are two major Giant Panda Reserve Centers, The Wolong Giant Panda Reserve Center and the The Chengdu Research Base of Giant Panda Breeding. The Wolong Center was devastated by the May 12, 2008, earthquake and is now in the process of rebuilding. The Chengdu Research Base was not physically damaged but tourism to the base since the earthquake has dropped exponentially. The Chengdu Research Base is located 6 miles outside of Chengdu City. It was founded in 1987 with six pandas rescued from the wild. It has grown to become an internationally recognized research and educational facility. As of 2008 the Giant Panda population of the base was up to 83 individuals. The base is designed to exist in harmony with the surrounding environment in order to best simulate the Giant Pandas natural habitat. In addition to Giant Pandas the base is home to Red Pandas and other endangered Chinese animals. The base provides daily, guided tours of the grounds. It also includes a new interactive Giant Panda museum for tourists and local school groups. For those travelers interested in supporting the pandas in the long-term, you can participate in the “adopt a panda” program. 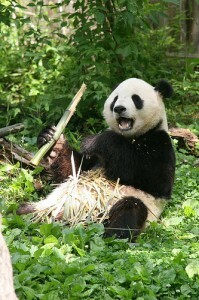 Travelers interested in volunteering should consider the Giant Panda Center in Bifengxia in Ya’an City. The Wolong Center previously accepted volunteers but is currently closed due to the earthquake damage. The Giant Pandas from Wolong have now been moved to the sister Center Bifengxia. Bifengxia is accepting individual and group volunteers. However, the trips must be prearranged with partner travel agencies.